Shogun® Twister Family Set will revolutionized the way people cook their food. Most people cook their food. Most people waste a lot of energy as the lost gas and heat never make it to cook your food .Shogun® Twister cookware is innovated from outstanding engineering that delivers benefit to the environment. Body: Every piece of the cookware is cast from molten aluminium resulting in a thick gauge body that provides excellent conductivity heat for tasty cooking. 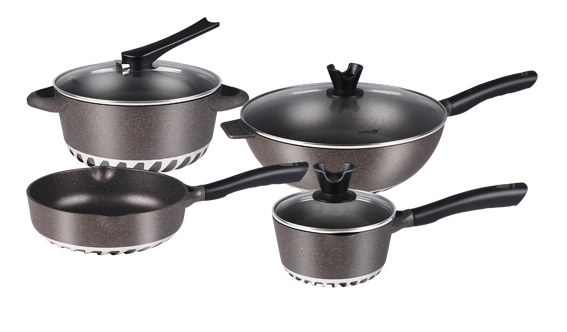 The Unique TWISTER BASE TECHNOLOGY :Shogun Twister is cast from molten aluminium with embedded twister grooves at the bottom of each cookware. It is individually crafted to perfection for optimum heat conductivity for that perfect tasty cooking. iii) THERMAL HEAT STORAGE EFFECT – The special spirals heat up and stores thermal energy which is transmitted to the cookware. TRITANIUM PRO NON-STICK COATING from Germany is a A NEW EVOLUTION of non-stick coating with ceramic reinforcement. After which the process is further reinforced with granite particulars to make it tougher and more non-stick and durable that before. Its Tougher. The coating is naturally non-stick, scratch resistant, durable, easy to clean, heats evenly, cooks healthy and completely safe. 4.3 A guarantee of high abrasion resistance.